I have to tell you two things about these cupcakes: first, they were delicious; second, the icing was a bit of a pain in the neck to make – I beat it forever using the electric mixer and it still did not firm up like the one on the magazine (I believe it happened because I used a different kind of cream). Start by making the custard: place the heavy cream and vanilla (seeds and bean) in a saucepan over low heat and cook until just comes to a boil. Remove from heat, cover and set aside for 30 minutes. Remove the vanilla bean and reheat the mixture. Place the egg yolks, sugar and corn starch in a bowl and whisk thick and pale. Slowly pour the hot cream mixture over the yolks, whisking continuously. Return to the saucepan and stir over low heat for 8-10 minutes or until the mixture thickens and coats the back of a spoon. Let cool, then refrigerate until required. Now, the cupcakes: preheat the oven to 180°C/350°F. Line two 12-hole ½ cup (120ml) capacity muffin pans with paper cases. Place the butter, sugar and vanilla in the large bowl of an electric mixer and beat until light and fluffy. Add the eggs, one at a time, beating well after each addition. Scrape the sides of the bowl. Sift over the flour, baking powder and salt and beat until combined. Add milk and beat in low speed until combined. Fold in the raspberries. Divide batter among prepared pans and bake for 15-18 minutes or until risen and cooked through when tested with a toothpick. Carefully remove from the pan and place on a wire rack. Drizzle the warm cupcakes with the sherry and cool completely. Finish the icing: add the double cream and the icing sugar to the cool custard and whisk until stiff peaks form. Spoon the icing over the cupcakes. i love the simple look of these cupcakes. the frosting is such a beautiful white! really looks amazing! Why on hearth do you quit watching In Bruges??? That movie is fun and sad at the same time... you have to see it 'till the end to appreciate it fully. And Colin Farrell is to good to miss. Give it another go, trust me! Beautiful cupcake, I didb't like the movie at all but then watched it fully as Brugges is the town we go a lot for shopping as it is onlt 18 km from our home. I used to hate raspberries; but now they are real favourite berry of mine! Plus, I think their bright pinkness really bring something special to cupcakes...just as you've displayed here. These cupcakes look so good, pity you can't find heavy cream in Brasil - I'm sure the icing was fantastic anyway! Mmmm... Looks amazing and certainly delicious! That's a different icing than what I usually make for my cupcakes. Your cupcakes turned out beautiful. I think these cupcakes look great...and yes also the frosting! 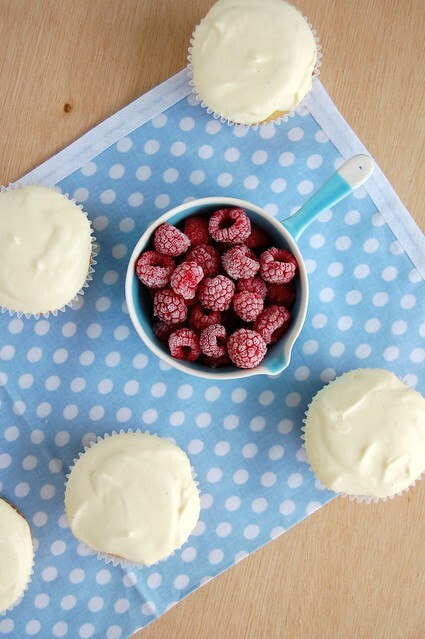 Raspberries and cupcakes always seem to go well together! 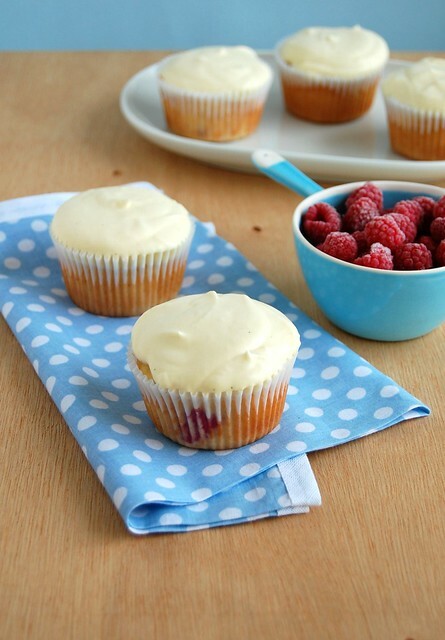 These cupcakes look delicious, and I also love the idea of a trifle in a cupcake liner. Martina, I agree with you about the sad/fun stuff, but it was too boring, I could not stand it anymore... I could not even wait for Ralph Fiennes to show up - and he's my favorite actor EVER! Thank you for you thoughts - I might try watching it again! Happy Cook, thank you! The city looks very beautiful on the movie. Just Cake Girl, thank you! Taranii, I do find heavy cream - I have never seen double cream here. Jennie, thank you for stopping by! Christelle, thank you for stopping by! Joey, thank you, my dear! Scarletta, thank you! I'm so glad you like these! oh these are right up my alley. the frosting sounds great. i love double cream and creamy things are my favorite! I agree; the frosting is beautiful! Nice to see raspberries paired with something other than chocolate, too. What a great cupcake flavor! Those are divine looking and sounding. Abby, I could not agree with you more - these berries are delicious in so many ways!